Chinese President Hu Jintao has agreed on a series of economic deals in Sudan, which China has protected from UN sanctions over the Darfur conflict. China announced an interest-free loan to build a new presidential palace, and said it would build two schools. China already buys most of Sudan's oil. Mr Hu called for "dialogue" to find a peaceful solution in Darfur. Western countries have urged him to put pressure on Sudan over the conflict, in which 200,000 people have died. Mr Hu did mention Darfur in his discussion with Sudan's President Omar al-Bashir. Only Sudanese and Chinese journalists were allowed to see the discussion. Xinhua, China's state-owned news agency, quoted Mr Hu as saying: "Any solution [in Darfur] needs to respect the sovereignty of Sudan and be based on dialogue." He reportedly said that the United Nations and the African Union both had constructive roles to play and that wisdom and creativity were needed to achieve peace. The rest of the day was devoted to cementing the strong economic ties between the two countries. China has used its veto at the UN Security Council to block moves to impose sanctions on Sudan unless it stops the fighting in Darfur. The BBC's Jonah Fisher in the capital, Khartoum, says the Sudanese government meanwhile has violated numerous ceasefire agreements, bombing civilians and launching ground assaults - often with weapons bought directly from China. As the main investor in Sudan and a key trading partner, China could have played a key role in trying to resolve the war in Darfur, he says. The UN wants to take control of the beleaguered African Union peacekeeping force in Darfur but Mr Bashir opposes this, saying the UN should only provide logistical support. Hundreds of people, Sudanese and Chinese, lined the streets of Khartoum to welcome Mr Hu at the start of his two-day visit - the first to Sudan by a Chinese leader. Sudan's economy is growing at close to 10% a year and much of that is down to its relationship with China. In the 1980s and 1990s, when human rights abuses and civil war forced Western companies to pull out, China stepped in. Beijing financed a 1,600km (1,000 miles) pipeline, taking oil from the south to Port Sudan on the Red Sea. Exports are now close to 500,000 barrels per day, with about 80% of that going directly to China. Sudanese economist Ali Abdulla Ali said working with China made sense. "When they came in, they wanted to help us to produce the oil because they needed it. So you really can't say much about that," he told the BBC. "They came to our help, they did not impose any conditions on us and so we had to take them." Our reporter says it is the lack of conditions which Beijing attaches to its business relationships which so infuriates Western governments. 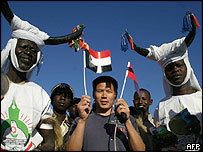 Mr Hu is visiting Sudan on the latest leg of his eight-country African tour. He arrived from Liberia, where he signed a number of aid and investment deals. China is becoming a major trading partner for countries across Africa, not just Sudan. China and Africa: Who benefits?